A typical view of Napier at dusk. 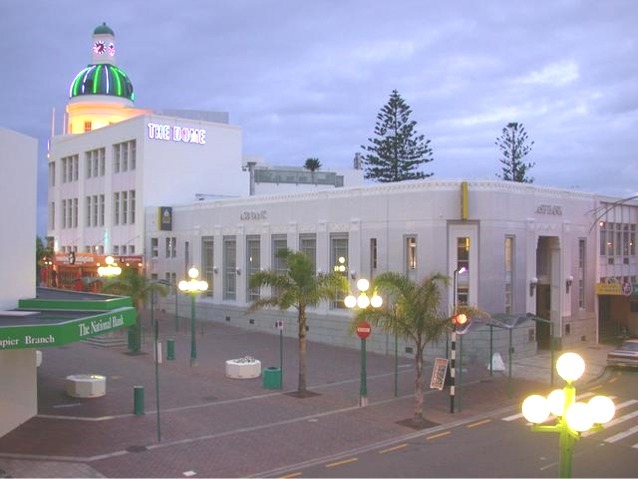 Napier is an important port city in Hawke's Bay, New Zealand. With a population of about 55,000, it is on the east coast of the North Island, about two hours drive north of the capital, Wellington. It is the major city in the Hawkes Bay region which is the largest crossbred wool centre in the Southern Hemisphere and one of the largest apple, pear and stonefruit producing areas in New Zealand. It has also become an important grape growing and wine production area. There are large frozen meat, wool, pulp and timber tonnages passing through Napier’s port. Napier is a popular retirement city and tourist resort, and has one of the most photographed tourist attractions in the country, a statue on Marine Parade called Pania Of The Reef. In 1931 Napier was levelled by an earthquake and ensuing fires which killed 258 people. The city was rebuilt in the popular Art Deco style of the time, and remains a fine example of this type of architecture: it is reputed to be the largest collection of Art Deco buildings outside Miami. In January 1945, the German submarine U862 entered the Port of Napier undetected. That event later became the basis of a widely circulated post-war myth that Kapitanleutnant Heinrich Timm took his crew ashore near Napier to milk cows to supplement their rations. First European to see the future site of Napier was Captain James Cook who sailed down the east coast in October 1769. He commented: "On each side of this bluff head is a low, narrow sand or stone beach, between these beaches and the mainland is a pretty large lake of salt water I suppose." He said the harbour entrance, was at the Westshore end of the shingle beach. Napier has a well documented Maori history. When the Ngati Kahungunu party of Taraia reached the district many centuries ago, the Whatumamoa, Rangitane and the Ngati Awa and elements of the Ngati Tara existed in the areas of Petane, Te Whanganui-a-Orotu and Waiohiki. Later, the Ngati Kahungunu became the dominant force from Poverty Bay to Wellington. They were one of the first Maori tribes to come in contact with European settlers. Chief Tu Ahuriri cut a channel into the lagoon space at Ahuriri because the Westshore entrance had became blocked, threatening cultivations surrounding the Whanga and the fishing villages on the islands in the lagoon. The rivers were continually feeding freshwater into the area. Te Whanganui-a-Orotu is still regarded as a Taonga Tuku Iho (a treasure for all time). Traders, whalers and missionaries were the first Europeans to visit the area and investigate establishing residency, and in the 1850s farmers and hotel-keepers arrived. The Crown purchased the Ahuriri block (including the site of Napier) in 1851. In 1854 Alfred Domett was appointed Commissioner of Crown Lands and resident magistrate at Ahuriri. A plan was prepared and the town named after Sir Charles Napier, hero of the Battle of Meeanee in the Indian province of Scinde. Domett named many streets in the settlement to commemorate the great colonial era of the British Indian Empire. He also displayed his own literary preferences by naming streets after famous artists and literary figures. 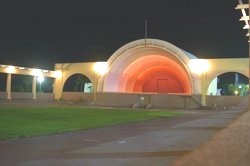 The Sound Shell in Napier. The town was constituted a borough in 1874 and development of the surrounding marsh lands and reclamation proceeded slowly. Between 1852 and 1876 Napier was the administrative centre for the Hawke?s Bay Provincial Government but in 1876 the Abolition of Provinces Act dissolved provincial government, replacing it with a central assembly in Wellington. Development was generally confined to the hill and to the port area of Ahuriri. In the early days Napier consisted of an oblong mass of hills (Scinde Island) almost entirely surrounded by water, from which ran out two single spits, one to the north and one to the south. There was a swamp between the now Hastings Street and Wellesley Road and the water extended to Clive Square. Some 4000 ha of today?s Napier was undersea before the earthquake lifted if up.